If you can’t find the answer to your question here, feel free to call us at (503) 932-1609. What does an insurance copywriter/financial copywriter do? An insurance/financial copywriter collaborates with advertising agencies, marketing directors, and creative teams who are looking for well-written content that delivers consistent, ongoing, and valuable information to customers and prospects so that the ultimate reward is earning their business and loyalty. What are the benefits of hiring an insurance copywriter/financial copywriter? Hiring an insurance copywriter allows you to push-out and deliver content in a timely manner, without adding additional staff or going over budget. If you’re overwhelmed by the thought of creating content or short on resources, ideas, or time, hiring a copywriter can help. The fact is, insurance and financial buyers are inundated with promotional messages from companies just like yours every day. Be certain that the insurance copywriter you work with can help you create content that breaks through the noise, speaking to buyers in their language – clearly describing how you can solve their problems. Content that’s this powerful and focused, helps your customers feel as though you truly “get” them. Why is it important to hire a copywriter with an advanced certification in Search Engine Optimization (SEO)? If you’re putting out online copy that’s not reaching your target audience, you’re essentially throwing your hard earned marketing dollars away. Writing spectacular online copy means diving into your target market’s psyche and learning everything you can – before writing a single word. Today’s online content MUST be powerful enough to encourage your reader to take the net conversion step. A copywriter who is SEO certified knows how your target audience searches online and how to write persuasive, top-positioned copy that “clicks” with your audience. 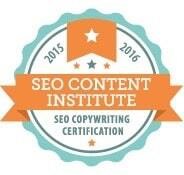 Yes, by the only industry-endorsed online training that certifies copywriters in SEO copywriting best practices. The fact is, Google’s algorithm is constantly changing and copywriting techniques that worked even six months ago may not be relevant today. For this reason, my SEO certification is updated on a bi-annual basis, ensuring that I stay abreast of the latest information that’s crucial to my client’s rankings – as well as their business’ bottom line. Is it important to hire a copywriter with insurance and financial experience to write for your company? You wouldn’t hire a plumber to fix your roof, would you? In today’s competitive industry, you have options when it comes to hiring a professional copywriter. But before you do, make sure they offer you content marketing services that are based on years of hands-on, in-depth experience. For example, do they have a working knowledge of insurance and financial processes, regulatory complexities, industry specific products and services? What about maintaining industry regarded designations to ensure a razor sharp focus on insurance and financial markets? What types of projects can KMC help me with? If you’re business needs content (both online and off), we can write it. From sales communications to customer communications, marketing communications to public relations. Projects can be anything from a one-time marketing campaign to ongoing content marketing. What does it cost to hire an insurance copywriter/financial copywriter at KMC? Typically, all copywriting at KMC is based on a per project basis – not hourly. This allows my clients to better plan and budget their marketing dollars.